AT40 specials included: "Twentieth Anniversary Special"
AT40 specials included: "All American 4th of July Special"
No AT40 specials aired during 1992. 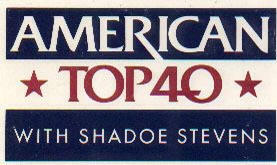 AT40 switches charts again, from the Hot 100 Airplay chart to the Top 40/Mainstream chart. No AT40 specials aired during 1994. The final AT40 airs January 28, 1995. Shadoe ends the show by playing "Happy Trails"
News headlines from 1998 include: The movie Titanic breaks box-office records, and Bob Barker's game show The Price is Right, aired his 5,000th episode on CBS in the summer. AT40 specials include "Top 40 of the 1990s" and a special covering music from the entire rock era. News headlines from 1999 include: President Clinton is acquitted, and Latin pop breaks through to the mainstream.